Green Writers Press, 9780996087261, 236pp. While Glaciers Slept weaves together the parallel stories of what happens when the climates of a family and a planet change. M Jackson, a noted scientist and National Geographic Expert, reveals how these events are deeply intertwined, and how the deterioration of her parents’ health was as devastating as the inexorable changing of Earth’s climate. Jackson poses a stark question: if losing one’s parents is so devastating, how can we survive the destruction of the planet that sustains us? Jackson draws both literal and metaphorical parallels between the degradation of the climate and her parents’ struggles with cancer. Nonetheless, Jackson shows that even in the darkest of times we cannot lose hope.Jackson guides us to solar, wind, and geothermal solutions, bringing us along on her expeditions to research climate change and to educate people about how to stop it. Scientists are continually looking for better ways to translate hard science into human language and that is precisely what this book does. While Glaciers Slept shows us that the story of one family can be the story of one planet, and that climate change has a human face. Climate change, she convinces us, is not just about science—it is also about the audacity of human courage and imagination. Dr. M Jackson is a geographer, glaciologist, environmental educator, 2018 TED Global Fellow, and an Explorer for the National Geographic Society who researches and writes about glaciers and climate change worldwide. M earned a doctorate from the Geography Department at the University of Oregon, where she examined how climate change transformed people and ice communities in Iceland. A veteran three-time U.S. Fulbright Scholar in both Turkey and Iceland, M currently serves as a U.S. Fulbright Ambassador. M works as an Arctic Expert for the National Geographic Society, holds a Master of Science degree from the University of Montana, and served as a Peace Corps Volunteer in Zambia. She’s worked for over a decade in the Arctic chronicling climate change and communities, guiding backcountry trips and exploring glacial systems. Her 2015 book While Glaciers Slept: Being Human in a Time of Climate Change weaves together the parallel stories of what happens when the climates of a family and a planet change. Her 2018 book, The Secret Lives of Glaciers, explores the stories of Icelandic people and glaciers through the lens of climatic changes. She is currently working on In Tangible Ice, a multi-year Arctic project examining the socio-physical dimensions of glacier retreat in near-glacier communities across all eight circumpolar nations. Bill McKibben is an author and environmentalist. His 1989 book The End of Nature is regarded as the first book for a general audience about climate change, and has appeared in 24 languages. He is founder of 350.org, the first planet-wide, grassroots climate change movement. The Schumann Distinguished Scholar in Environmental Studies at Middlebury College and a fellow of the American Academy of Arts and Sciences, he was the 2013 winner of the Gandhi Prize and the Thomas Merton Prize, and holds honorary degrees from 18 colleges and universities; Foreign Policy named him to their inaugural list of the world's 100 most important global thinkers, and the Boston Globe said he was "probably America's most important environmentalist." A former staff writer for the New Yorker, he writes frequently a wide variety of publications around the world, including the New York Review of Books, National Geographic, and Rolling Stone. He lives in the mountains above Lake Champlain with his wife, the writer Sue Halpern. "I cannot untangle in my mind the scientific study of climate change and the death of my parents." M Jackson is a scientist, National Geographic Expert and glacier specialist, but her memoir While Glaciers Slept: Being Human in a Time of Climate Change rarely takes a scientific perspective and never claims objectivity. Rather, Jackson tells the story of losing both her parents when she was a young woman just embarking on life, and the trauma and extended grieving process that resulted. 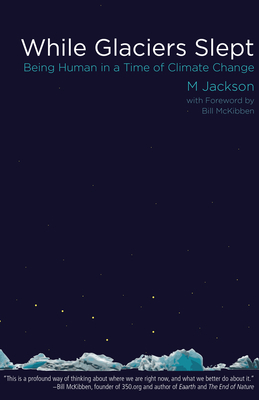 Following a brief, lovely foreword by Bill McKibben, Jackson poetically conflates her loss with the slow and still mysterious effects of anthropogenic climate change. Her scientific background and explorations of fascinating places—Denali and Chena Hot Springs in Alaska, Zambia with the Peace Corps—inform her writing and yield striking images, as she runs on spongy Alaskan tundra or contemplates cryoconite holes atop glaciers. But it is the personal side of her narrative that allows Jackson to address society's psychological difficulties with climate change.